my personal blog on software development, agile methods, fast cars, politics, philosophy, etc. One of my awesome colleagues at Improving is up for an award. If you know Melissa (often responsible for coordinating our community events and get-togethers, plus all of the awards that Improving wins) please go vote for her. Looking for great agile training with industry experts? Hunting questions to help your everyday work? Climbing the agile mountain and stuck? 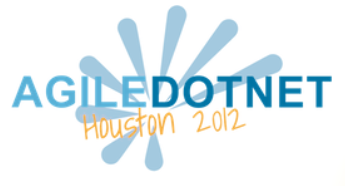 Not to worry, AgileDotNet is coming to Dallas on March 1st, 2013! AgileDotNet unites the worlds of .NET development and Agile methods, delivered by agilists passionate about providing superior content in unique settings. This will be the fourth year of AgileDotNet, and the content will rock you! AgileDotNet brings developers, QA, scrum masters, project managers, and business leaders with all levels of experience to empowering and unique sessions across four tracks. You’ll return to work with the tools, motivation, and support to be more agile – as an individual and as part of a team. #ADN13 is different from those past. Despite maintaining a high bar for great workshops and discussions, we realized there was a common theme among many of the most steadfast agile coaches and leaders trying to bring change within their enterprise. The organizations are difficult to change. Budgets, risks, unfamiliar territory, and planning are all excuses that point to one thing. The enterprise has trust issues. At #ADN13, we will break the trust barrier down. With a wrecking ball. You will learn from passionate field-tested agilists how to establish trust amongst the team, with management, and throughout the organization as a whole. Regardless of the role you play. And as if the conference is not cool enough already with agile experts, Scrum experts, and FOOD TRUCKS! Improving decided to up the game another notch. After the conference on Friday, there is a Saturday March 2nd workshop at the Improving Offices. This is just crazy! Improving Enterprises is pleased to offer an Agile ALM with Microsoft Team Foundation Server Workshop. In this hands-on, mentored workshop, we will dive into how Visual Studio supports the Development process, the Quality Assurance process, and the Project Management process. We will have a full TFS environment, interactive labs, and instructors on hand for questions. We will be breaking the day into the three segments. Each section will include a free form section to bring your problems to the ALM Team at Improving and get some much needed answers. Development Lifecycle Management is all about getting a streamlined routine that doesn’t hinder velocity and contributes to quality code. We will guide through developing, developer-testing, and deploying an application. Agile Project Management can be quite challenging, and managing multiple projects even more so. We will dive into how to set and measure effective KPIs, automate reporting, and manage work items in an effective, logical, and visible way. Quality Assurance Management is encapsulated in an agile environment able to effectively and quickly report on the status of the product. We will walk through defining test cases, writing test steps, recording automation, and enabling regression testing. and discover best practices around Agile ALM using Microsoft® Visual Studio and TFS. And don’t forget to bring your real-world problems for our on-site mentors! Next week is Wintellect’s Devscovery in Houston at the Microsoft offices. It’s a 3-day conference/training session where speakers cover 3 tracks of content all about .NET development. Chris Weldon and I are giving a lunch-time presentation to everyone on Tuesday about test-driven development (TDD) and playing the pair-programming game to show how well TDD can work. Wintellect has a great reputation for providing quality developer training. And they’ve been delivering this conference for years all around the US. I’m sure the Houston event will be a great one, too! On July 10th, come join the Microsoft Cloud Summit 2012 at Microsoft’s Las Colinas facilities. Scott Guthrie will be there to deliver the keynote presentation and you’ll get to see in person the demonstration of all the newly announced Infrastructure as a Service capabilities, plus the Platform as a Service features that have just been added. The newly minted Microsoft Cloud DE (but long-time MS Developer Evangelist), Chris Koenig, will be there. Hopefully many of Improving’s devs will be there, too, since Improving is a member of the elite group of Microsoft partners in the Azure Circle. We might even showcase some of our customer experiences with Azure. Unfortunately, I won’t be there since I’ll be in Toronto for WPC. Register now before it fills up. We just got confirmation on the final slots for AgileDotNet Houston. Chris Tullier, the region’s Microsoft Developer Technical Specialist and Improving alumnus will be delivering the opening keynote on agile development with Dev 11. And, Markus Egger of EPS Software, a prolific writer, speaker, and Microsoft Regional Director, will be delivering the closing keynote. AgileDotNet is April 20th, so if you’re in the Houston area, register now and come see the industry’s best and brightest! Improving is hosting our third annual AgileDotNet conference in Dallas on Friday February 17th. It will be a day of presentations and discussion focused on agile software development on the Microsoft stack, ALM tools, and the leadership and cultural issues involved in agile IT. As the website says, AgileDotNet Dallas will be hosted at the Addison Convention Center, which is right near the Addison Circle and the big blue sculpture art thing. There are topics for everyone, weather you’re new to agile concepts or an experienced developer. For you PMI types, there are 7 PDUs (personal development units) up for grabs to help maintain your certification. The price is only $50 per person, which helps cover the cost of the venue and the food. Lunch is served and there’s a panel discussion with experienced leaders in the industry answering your questions. Come check it out!